The big advantage of this system low cost maintenance, which we also offer. Concrete stain can be installed to your existing concrete or we can install a cementatious overlay. Reactive stains are stains that have an active element, usually acid, that reacts with the concrete. Acid stains will drive the pigment into the concrete by reacting with the free alkali in the cement. Clear sealers are applied to protect the stain. 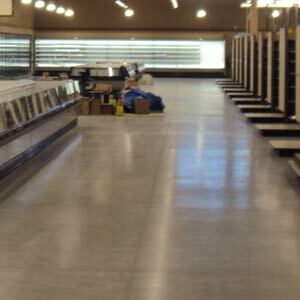 Sealers vary from water based curing agents to epoxies: they can be glossy or satin finish. 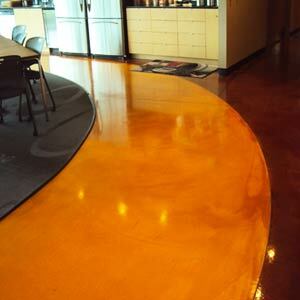 Concrete dyes are typically added to polished concrete floor systems. Unlike reactive stains, dyes are a little more vibrant. These use either water or a solvent, like acetone, as the media to deliver the pigment into the concrete. Broadcast Floors: These can vary from vinyl chips to color quartz media, broadcast by hand or with the use of equipment. 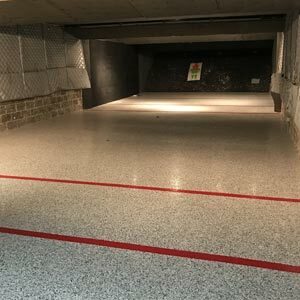 We install the decorative media into the following resinous flooring systems; Epoxy, Methyl Methacrylalate (MMA), or Urethane Mortars. Each of the resinous systems has advantages and disadvantages. We can help find the right system for your application. Coatings: Within the coating category, we have epoxies with metallic pigments, which can give a 3D effect. For a stain floor with out a stain and quick turnaround, we can install Dur-A-Flex Cryl-A-Stain. This has a one hour cure time. It is more durable than a typical stain and sealer application. Troweled & Self Levelling Systems: Epoxies, Methyl Methacylate (MMA), and Urethane Mortars can be installed. Systems will range in thickness from 1/4" inch (250mils) to 3/8" (375 mils). Signup for our email newsletter today! Don't worry, we don't like SPAM either. © Copyright 2017 - 2018 Northwest Floor Care, Inc. • All Rights Reserved.